Salmon is full of good-for-you DHA and relatively low in bad-for-you mercury, making it an excellent health choice for brain and body. Roast the sesame seeds on a pan over low heat, with no oil, for 2 minutes. Cool to room temperature, then add to recipe for a nuttier sesame flavor! In a bowl, mix together soy sauce, brown sugar, rice vinegar, sesame oil, grated ginger, and sesame seeds with 2 tablespoons water. 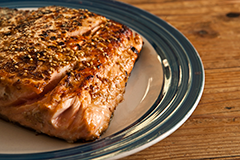 Put salmon in a lidded container and pour 2/3 of the marinade mixture into the container. Reserve remaining marinade. Close the lid and shake gently, making sure the marinade has covered entire salmon. Place in refrigerator for 30 minutes. Heat frying pan coated with canola oil over high heat. Add salmon and lower the heat to medium. Cook for 5-6 minutes, until salmon is no longer translucent. Flip with tongs and continue cooking the other side, for another 5 minutes. Pour remaining marinade into the pan. Cook over low heat until sauce has evaporated. Remove from pan and serve with chopped scallions on top.